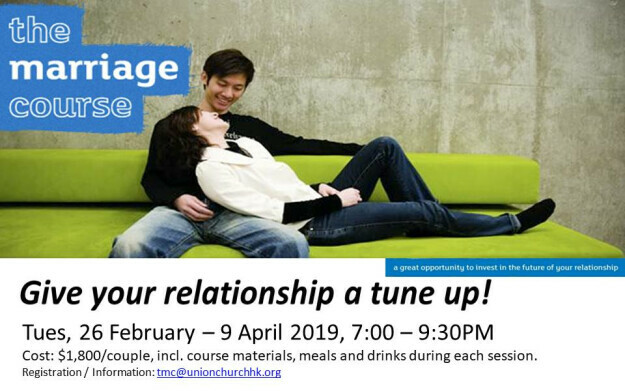 “The Marriage Course” is being offered again on Tuesdays, from 26 February to 9 April 2019 (7 weeks). Whether you are newly married or have been married for years, this 7-week course is open to ALL couples and offers a lifetime of practical ideas and tools to keep your relationship strong. The course is designed for couples who want to invest in their relationship and to continue to strengthen their marriage or who are looking to address specific challenges. The course is based on Christian principles but is designed for ALL couples with or without a church background. There is NO group sharing with other couples in the course; each couple is seated in their own table of 2 so they can go through the materials, chat and enjoy a meal together between themselves privately. Course fee: HK$1,800 per couple; cheque payable to “Union Church” or online transfer; fee includes dinners & course material; bursary available. Please contact Joanna Yau at for more information. Please complete below to join the Marriage Course.